Writing a biographical film may sound really easy. After all, everything is there for you. However, real life is chaotic and messy, not to mention contradictory and confusing. A biographical screenplay should be none of these things. So, how do turn a life into a story? During film school, I took a class about biographical films and the instructor claimed that the key to bio-pics was to make sure your main character is motivated to become exceptional because of love. Specifically, romantic love. In the most simplistic terms, Alexander Graham Bell invented the telephone to impress a girl, John Nash cured his own schizophrenia to get his wife back, and Gandhi did not lead Indian into independence to widen his dating pool. Obviously, I don’t agree with this idea. Yes, you can write a bio-pic that way, however, I think there’s more to it. It’s about more than the love of a particular person, it’s about passion. That can mean a passion for another person, or a thing, or an idea, or even an animal. As a screenwriter, you have to find your main characters central passion then make sure everything in your script aligns with that passion. Make sure your main character makes decisions based on their passion. And then make sure that the characters around them mirror that passion. Here are five films that take different approaches to biographical stories. This sumptuous film tells the story of Georgiana Cavendish, the Duchess of Devonshire. She lived a remarkable life of wealth and comfort, presided over an influential political salon and even campaigned—in a time when women could not even vote—was an inveterate gambler, was a renowned fashion plate, and had a tempestuous marriage that eventually settled into a rather comfortable Ménage e Trois. Kiera Knightly plays Georgiana Cavendish, The Duchess of Devonshire. Photo courtesy Paramount Vintage. The screenwriters, Jeffrey Hatcher, Anders Thomas Jensen, and Saul Dibb were faced with the challenge of pulling all these disparate elements together. They accomplished that by lining up the primary motivations, or passions, of the three main characters. The most important decisions Georgiana makes are made with her children in mind—she rejects the love of her life Charles Grey when the Duke threatens to take her children. The Duke wants nothing but a male heir and treats Georgiana poorly until she provides one, at which point he pays off her gambling debts. While Lady Bess, first Georgiana’s close friend and later the Duke’s lover, makes it clear she’s only taken the Duke as a lover so that he’ll get her children back from her estranged husband. The final image of the film supports this unifying theme, showing Georgiana and Lady Bess playing in the gardens with their children. In Megan Leavey, a young woman joins the Marines in order to focus her life but that doesn’t work out until she’s punished by being told to clean out a kennel. There, she meets a German Shepherd, Rex, being trained to sniff out bombs and becomes fascinated by the idea of training dogs to do this important work. After she fights to become a trainer, she begins working with Rex. The two go on two tours of Iraq eventually earning the Purple Heart after they’re wounded while sniffing out IEDs. Unlike most biographical films, this one is centered on the relationship between the main character and an animal. Megan does have a short-lived romantic relationship, but the film is structured on her love of Rex and completes after she’s left the service and fights to adopt the retired Rex. The story of one of the survivors of the Boston Marathon bombing, Stronger is a film that most closely follows the idea of doing it all for romantic love. When Jeff Bauman loses both of his legs in the bombing, he finds himself relying on his on-again/off-again girlfriend, Erin. The screenplay, by John Pollono, follows their attempts to build a relationship and Jeff recovers, fights PTSD and learns to walk on prosthetic legs. 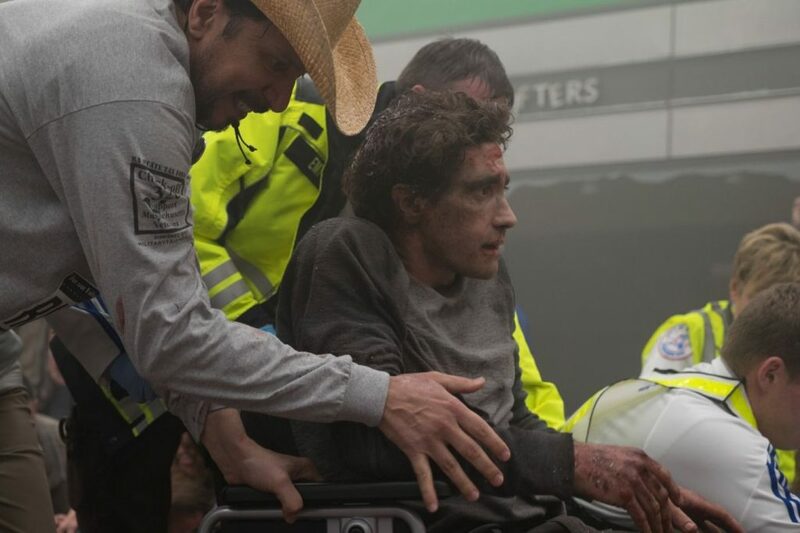 Jake Gyllenhaal stars as a double amputee in Stronger. Photo courtesy Lionsgate. The real core of the film though is Jeff’s struggle with the role of the hero which is thrust upon him. The more the people around him push that role upon him the further he slips into depression. The further he slips into depression the more damage he does to his relationship with Erin. Finally, two things happen that pull him out of his downward trajectory. First, he finds out that Erin is pregnant, and second he meets the man who saved him by putting tourniquets around his injured legs, Carlos. When he meets Carlos, he learns that the man who saved him has a tragic past that he has only made sense out by helping others. By committing to others, Jeff saves himself. Britain’s Queen Victoria is often a subject for biographical films—there are two about her later life, both starring Judi Dench—and TV series’ like the current Victoria. On its surface, Young Victoria may appear to be about the love story between Victoria and her future husband, Albert. But, it is really about Victoria’s love of her country and her desire to be a good queen at a time when women were still not allowed to participate in politics, no less govern. One of the most important scenes in the film is one in which Albert indicates that he’s on her side, and wishes to help her govern rather than manipulate her as others have attempted, and continued to attempt. It is the reason she chooses him and the reason their relationship works. 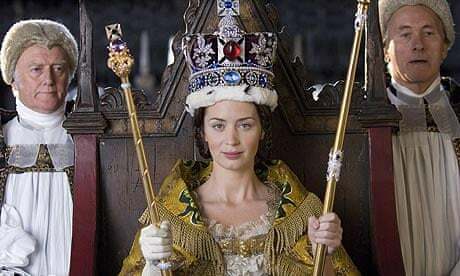 Emily Blunt as Queen Victoria. Photo courtesy Sony Pictures. Following the story of a wild-living rodeo rider who contracts AIDS in the mid-1980s and then fights to make experimental drugs available to himself and others, The Dallas Buyer’s Clubis, at its core, about the human struggle to survive. What elevates the screenplay by Craig Borten and Melisa Wallack beyond a simple man vs. nature tale, is the stong arc they’ve given the main character, Ron Woodroof. He begins as a somewhat bigoted redneck and makes his way to accept that we’re all simply struggling to survive, and therefore deserve respect. So, what are your favorite bio-pics? And what are they centered on? What are the techniques the screenwriters used to bring cohesion to the film? 4 Replies to "WRITING TRUE: A Look at Biographical Screenplays"
Great observations and advice, Marshall. I’m developing a series on American explorer Josiah Harlan who became a king in Afghanistan in the 1830s. It’s been a challenge since, aside from his own writings and the dismissive commentary from British officials and historians, there is scant information about the man’s personality. So, as you suggest, I had to zero in on what made this man so driven and determined to become a king in such a distant and isolated part of the world that he was willing to risk life and limb for. Even though this may not have been what drove the real Harlan, I had to find something that was inherent to his character and had severely marked him as a young man. Something that was also relatable to a mass audience. Once I found that nugget of truth, it defined everything he did and also provided the major theme of the show reflected in the first scenes of the pilot as British colonial brothers tussle over an imaginary kingdom while the soon to be Afghan king Dost Mohammed has his half-brother’s eyes gouged out in retaliation for the butchering of his elder brother (all true by the way) in order to seize control of Kabul. Sibling rivalry and the need for parental approval can be subtle and all consuming. Thanks for the comment. I wonder, is The Man Who Would Be King a fictionalized version of this story? It is not fictional! Discovered in diaries found in an attic by a descendant in Philadelphia in 1968, we read the adventures of Josiah Harlan. From a Quaker family, Harlan, a seaman crushed by the rejection of a young woman, vows never to return to America. Soon after, in 1820, he becomes the first American to enter to Afganistan and becomes a soldier, spy, linguist, doctor, naturalist and writer, a man who wanted to be a king and did, and commanded an army in combat. This from the book “The Man Who would Be King,” by Ben Macintyre 2004, Farrah, Straus, Giroux, 2004. Kipling obviously had heard stories about him. Read: “The Man Who Would be King,” by Ben Macintyre, Farrah, Straus and Giroux, 2004.